Kiddush this week is prepared and sponsored both by Daniel Engel in memory of his father, and also by Rabbi Matt Abelson + Shiri Cohen in memory of Matt's grandfather. Yehi zichro varuch - may their memories be for a blessing. R. Emily has regular drop-in office hours on Tuesdays 11-1 and Thursdays 3-5 if you need or want to call or stop by for any reason. Of course, you can always call or email to make an appointment during the day or on Tuesday or Thursday evenings, but if having a set time during the day is helpful for you, it's available! ​​​​​​​-- and thank you in advance for doing so! Miriam was our wise, kind executive director for almost 20 years. Join us for a special Kiddush, following morning services, to celebrate Miriam’s life and her lessons for us all. If you have memories of Miriam and would like to speak, please contact Barbara Model to be included in the program. Also if we don’t see you every week at lunch (and even if we do), let Barbara know you plan to attend. The kiddush committee wants to make sure we have plenty of food and tables set for the occasion. Please click here to contribute to this kiddush. Donations in excess of the kiddush cost will go to the shul accessibility project in Miriam’s name. To prepare for Pesah 5779, Hadar faculty will hold a series of lectures at Harvard Law School (Milstein East- 2nd floor of Wasserstein Hall), four Tuesdays in a row. The Case of the Stolen Matzah: Do the Ends Justify the Means? One of the enduring questions of human political life and our attempts at progress is whether the ends justify the means. The Talmud uses the case of some stolen matzah to probe the question of whether I can do a mitzvah with an object with a tainted pedigree. At what point must we draw the line and refuse to use an object that came to use illicitly, and at what point can we say that what is in the past is in the past? For full descriptions of upcoming classes, check out the Hadar website, and share our Facebook event for this series. We hope to learn with you soon! Stay tuned for an upcoming screening of shul member Joe Sousa's PBS documentary Cities of the Sky! In the spirit of the recent eclipse, the movie screening will give us a chance to compare Jewish and Native American narratives about time and space. Cities of the Sky explores the creation of some of the ancient world’s largest and most splendid cities. Were people across Native America inspired by celestial phenomenon to build their communities? Answers are revealed in American urban centers that bloomed from the Mexican jungle, a massive multi-cultural city in Central Mexico that is among the largest urban centers in history, and the capital of South America’s greatest empire. Take me out to the ball game! We are excited to organize a group from shul to head over Fenway on June 13 for Jewish Heritage Night with the Red Sox. Tickets cost $36 - click here to sign up now! Purim is coming! If you are interested in leyning, please email our leyning coordinator. If you are interested in helping with the spiel, please email Brian Eisenstein. Please join us for the next Tremont Street Women's Book Group - Wednesday, March 6th at 7:00pm. We will be reading Shakespeare's Kitchen: Stories by Lore Segal. For meeting location and any other questions - please contact Maura Gould. Thank you! Save your spot today: Join Mayyim Hayyim for study and conversation about niddah (the practice of abstaining from sexual intimacy around the time of menstruation) within the context of queer relationships and bodies. The course will engage with traditional Jewish texts, voices from the queer community, and our own experiences. Facilitated by Rabbi Becky Silverstein, this course will focus on queer and trans voices and is open to people of all genders, sexualities, and experiences with menstruation. Meets February 6, 13, 23, 27, March 6, 13 -- 7-9 pm Register here! Interested in giving back? Looking to build or grow your Jewish Community? ReachOut! (a program of the Jewish Community Relations Council) offers numerous opportunities for Jewish young adults in their 20s and 30s to get involved and make a difference in the Greater Boston community. Through ongoing community service and Shabbat dinners, participants build relationships with people across Greater Boston and build their own Jewish community with peers who share their values. Check out Golda Meir House in Brookline on Monday February 11th at 7pm or Tuesday Meals at First Parish Church in Harvard Square on Tuesday February 19th at 5:15pm. Talk to Leah Robins to hear about her experiences with ReachOut! Cambridge Niddah Group: We invite you to join us for seudah shlishit, learning, and discussion about niddah ideas and practices. In this monthly gathering we dive deep into a wide range of rabbinic, historical, and contemporary sources on niddah and hold space for folks to share their personal experiences and questions. This group is open to non-male identifying people of any relationship status or sexuality. Our next gathering will be February 16. If you're interested in joining us in February or sometime in the future, email Rachel Jacobson. Thank you to Hadar Institute for supporting this group. Open Beit Midrash is gearing back up for the Spring! More info to follow soon. R. Bruce Alpert - The Priestly Garments: A Reminder of What? R. Shlomo Riskin - Where's Moshe? Kiddush this week is sponsored in part by Eli Witkin in honor of Linda Kasten + Peter Squires for all the holy work that they do for our shul! in honor of a very special half birthday for Chana! Recently, our longtime friend, colleague, and member Miriam Klapper passed away. In her memory, we will be dedicating kiddush on March 2 to be a time to come together and reflect on her life and service to the shul. Please click here to contribute to this kiddush. On February 15th, we will be hosting our last early community dinner of the year (Shabbat times are getting later; not to worry, though -- there will be other dinners!). Dinner will begin shortly after our weekly partnership davening, at ~6:30. This month we are having a Mexican-themed dinner with chicken/beef or bean fajitas. Kids' menu will be the same, but smaller portions. Sign up here by Monday, February 11th. As always, please let us know if you have any food allergies or concerns! This week, we mourn the loss of Samuel Brodsky, father of Bari Brodsky; André Dudkiewicz, son-in-law of Marion Bloch and David Cherson; Miriam Klapper; Tanya Rubiec, mother of Michele Potashman. We also have reason for blessing, as we celebrate the arrival of Baby Lillianfeld, son of shul members Bobby and Lisie Lillianfeld (more details to follow!) and as we also share our joy with community members Rebekah Emanuel and Michael Shafir on the arrival of their new daughter! This week, longtime friend, colleague and shul member Miriam Klapper passed away. In her memory, we will be dedicating kiddush on March 2 to be a time to come together and reflect on her life and service to the shul. Please click here if you would like to contribute to sponsoring this kiddush (choose the Kiddush Fund in the dropdown menu and note that it is in memory of Miriam). The first week of Rabbi Roth's Hebrew Class Reboot was a great success! With 7 more classes to go, all are welcome to attend, even if you were not able to make it this past Monday night. For more information, click here to email the office, or just come on by to class Monday night at 7 PM! Purim is coming! If you are interested in leyning, please click here to contact our leyning coordinator. If you are interested in helping with the spiel, please email Brian Eisenstein . Please join us for the next Tremont Street Women's Book Group - Wednesday, March 6th at 7:00 pm. We will be reading Shakespeare's Kitchen: Stories by Lore Segal. For meeting location and any other questions - please contact Maura Gould . Thank you! Thank you to Brian Eisenstein, R. David Roth, R. David Curiel and Joe Sousa for leading a festive evening of Tu BiShvat events, with a blood moon eclipse to top it all off! Great fun was had by all as nearly 100 people took part in the celebration. Thank you also to brewmaster David Engel for creating an eclipse-themed ale for participants to enjoy as a nightcap! Also, R Emily has regular drop-in office hours on Tuesdays 11-1 and Thursdays 3-5, if you need or want to call or stop by for any reason. Of course, you can always call or email to make an appointment during the day or on Tuesday or Thursday evenings, but if having a set time during the day is helpful for you, it's available! Engaged? Recently married? You'll want to know about an upcoming program for engaged and recently married couples called Beyond the Huppah. It’s a five-session seminar -- taught by Rabbi Miriam-Simma Walfish -- and each session focuses on a particular topic such as Jewish ritual, decision-making, sexuality, money, etc. The course is designed to strengthen your partnership and explore different ways of creating a Jewish home. The program will run Thursday evenings at Mayyim Hayyim, starting January 31st. If you would like to learn more and/or register, you can find it here. You may also reach out to MH Associate Director of Education, Leeza Negelev. Amanda Russell - Is It for Me or We? Ari Shishler - Did You Get My Message? NOTE: Due to the expectation of inclement weather this weekend, any cancellations will be posted on the shul website. Also, R Emily now has regular drop-in office hours on Tuesdays 11-1 and Thursdays 3-5, if you need or want to call or stop by for any reason. Of course, you can always call or email to make an appointment during the day or on Tuesday or Thursday evenings, but if having a set time during the day is helpful for you, now it's available! Can you leyn Torah? We are looking for you! Click here to sign up for the coming parshiyot (Yitro and beyond) -- and thank you in advance for doing so! A reminder that you may enter the building via the right-hand front door during services on Shabbat morning, and via the side door during kiddush lunch. As always, you may exit through any door, and please continue to park strollers outside. Thank you! The program will run Thursday evenings at Mayyim Hayyim, starting January 31st. If you would like to learn more and/or register, you can find it here. You may also reach out to MH Associate Director of Education, Leeza Negelev . In this time of renewed focus on the challenges of sexism, racism, xenophobia, fear, and threats of violence – and on action for peace, justice, and equality – please join us as we remember and celebrate the life and work of Rev. Dr. Martin Luther King, Jr. The City of Cambridge will honor and remember Dr. King and his legacy, as we gather at St. Peter’s Episcopal Church to hear members of the Cambridge community share readings of Dr. King’s words calling for peace, justice and transformation, as well as musical performances. We will also feature remarks by Ellen Semonoff, Assistant City Manager for Human Services for the City of Cambridge. In addition to the Commemoration and Remembrance, once again Many Helping Hands will sponsor volunteer activities for its Day of Service from 2-5:00 PM at City Hall, St. Peter’s, the YWCA, the Senior Center and other sites. Cambridge Niddah Group: We invite you to join us for seudah shlishit, learning, and discussion about niddah ideas and practices. In this monthly gathering we dive deep into a wide range of rabbinic, historical, and contemporary sources on niddah and hold space for folks to share their personal experiences and questions. This group is open to non-male identifying people of any relationship status or sexuality. Our next gathering will be February 16. If you're interested in joining us in February or sometime in the future, email Rachel Jacobson . Thank you to Hadar Institute for supporting this group. We are excited to welcome Rabbi Robbie Harris to shul this Shabbat for a series of weekend events! See below for the full schedule. Interested in Shabbat dinner next Friday (1/18) or Tu B'Shvat next Sunday (1/20)? Deadlines are Monday for these events, so sign up by clicking the links here or see below for more details! Also, beginning next week, R Emily will have regular drop-in office hours on Tuesdays 11-1 and Thursdays 3-5, if you need or want to call or stop by for any reason. Of course, you can always call or email to make an appointment during the day or on Tuesday or Thursday evenings, but if having a set time during the day is helpful for you, now it's available! Davening, Dinner, and Board Games! Join the partnership between Partnership + Minyan Tehillah for davening and dinner beginning at 5:15, with dinner shortly after davening ends (~6:30). We will plan to have additional snacks and desserts along with drinks after dinner. Feel free to stay, hang out, sing, and bring/play board games! Sign up here. p.s. Tehillah is my middle name; thanks for making Minyan Tehillah my namesake. Rabbi Shlomo Riskin - What About Free Will? Warm up this Shabbat with friends new and old at Tremont Street! Service times and kiddush listed below; all are welcome. In response to recent concerns, when you arrive for Shabbat services, the right-hand front door will be unlocked during davening, and the side-door by the playground will be unlocked during kiddush. strollers must be parked outside. Miriam + Michael -- and Gili, Ruthie, Shulie + Shira -- miss Cambridge greatly and will be back this summer. We are looking for a 2 or 3 bedroom place to rent for the months of July and August (exact dates are somewhat flexible). Please email us (<-- link) if you know of something that will be available. many thanks; we can't wait to see all you! Meet the camp director and staff and learn how Camp Grossman is a place to be active, a place to make friends and a place for building skills and community. Join us for an info session on Sunday, January 20 from 2-4pm at JCC Greater Boston, 333 Nahanton Street in Newton. This event is free and open to the public. A vibrant Jewish day camp located on 75 acres in Dover's pine-studded Hale Reservation, we offer summer days filled with aquatics, sports, arts and nature for campers ages 4 ½-15. Bus transportation available to and from a variety of locations throughout Greater Boston. Extended day available in Newton (at the Leventhal-Sidman Center). Can't make it? Register online using our brand new online registration! Come meet the camp director and learn all about Camp Kaleidoscope at JCC Greater Boston at our open house on Sunday, January 20 from 2-4pm at JCC Greater Boston, 333 Nahanton Street in Newton. With art, music, dance, theater, science and nature activities, campers of all ages have opportunities to spread their creative wings. Our talented staff of artists, performers and educators inspires campers to try new things in a pluralistic Jewish setting that embraces campers of all backgrounds, faiths, and beliefs. Located at JCC Greater Boston's Leventhal-Sidman Center in Newton, with transportation available from the surrounding areas. Can't make it? Register online using our brand new online registration ! We need your help! Volunteer Income Tax Assistance (VITA) is a federal program in which trained community members assist income-qualifying individuals in preparing and filing their income tax returns. VITA serves to help the community maximize access to the Earned Income Tax Credit (EITC), America’s largest anti-poverty program. We seek volunteers’ help for 2 hours per week at our clinic in Cambridge (402 Rindge Ave—across the street from Alewife T Station) from late January through mid-April 2019. Training is provided; no prior experience is needed or expected. This year, our tax clinic helped people realize nearly $90,000 in EITC. Please help us help more people in 2019. For more information, contact Tremont Street member Sam Hamer. Rabbi Danya Ruttenberg - Who Really Hardened Pharaoh's Heart? We welcome R. Robbie Harris back for a full weekend mid-winter with the community. The weekend will include several opportunities to learn with Rabbi Harris: Friday evening, there will be a catered dinner and a talk by Rabbi Harris on gender in the Joseph narrative, Joseph and his Amazing Rainbow Dreamcoat. Saturday morning, he will offer a d'var Torah on the week's parsha, titled The Cow that Laid an Egg, followed by an in-depth Lunch + Learn text study over dessert, continuing our learning about the Joseph story. This promises to be a great weekend of learning, and huge thanks go to Carol Ehrlich, David Sandberg, and Leah Robins, who have helped us get to this point! 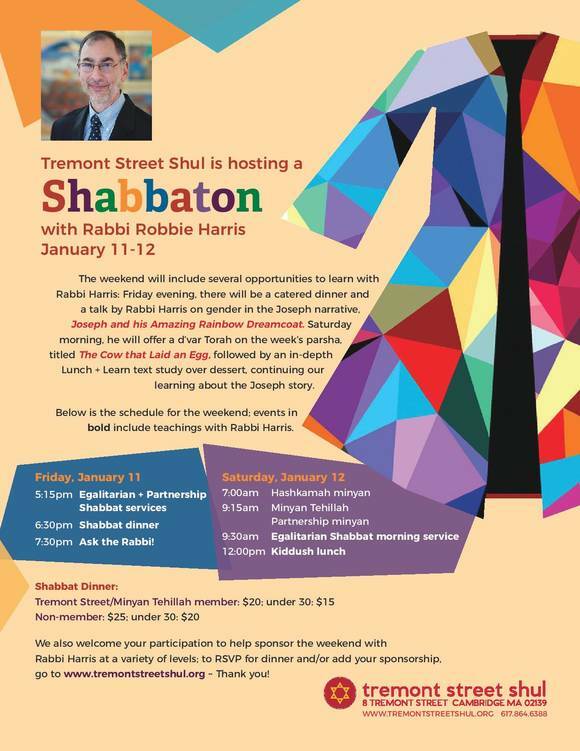 This Shabbaton is an opportunity to spend more time learning with Rabbi Harris, our shul's beloved High Holiday leader. To RSVP for Shabbat dinner or to become one of the sponsors for this shabbaton, click here for more details. Join Tremont Street and Asiyah for a Tu BiShvat Seder, learning, and lunar eclipse-watching the evening of Sunday, January 20 (MLK weekend). There will be two sides to the evening: a family-friendly dinner and seder at 5:00 and a later seder at 8:00 followed by a screening of the PBS film, Cities of the Sky directed by Joe Sousa, learning about eclipses and watching the main event in the cosmos. We will also head outside to view the eclipse! For eclipse times, click here. The cost of this event for Tremont Street and/or Asiyah members is $15/person ($45 max for families); to RSVP, click here. Deadline for dinner is Monday night, January 7th. Also, if you’d like to sponsor a bottle (wine $36, or grape juice $18), please note that in your RSVP -- and thank you! As you may remember from our weekly update earlier this month, Tremont Street recently signed on as one of the newest partners of CJP's Ruderman Synagogue Inclusion Program. It was an evening of learning and conversation with a panel by Gateways* and CJP staff about many types of inclusion and best practices that synagogues are adopting and a keynote by author Anita Diamant who spoke about the universal design at May​y​im Hayyim. We're looking forward to sharing these learnings and working together with you to continue to cultivate greater inclusion in our shul. Our community was well represented by Leah Gordon, Sarah Magidson, Barbara Model, Leah Robins and Director of Community Development Rabbi Emily Mathis. Please ask them about the event and how you can get involved in our Inclusion Committee. * Boston's organization dedicated to an inclusive Jewish community! In the next several days, you will be receiving a reminder email to log into your account to set up your member information (if you have already done so, thank you!) -- and, if you have a balance for dues and/or your Kol Nidre pledge, an email with a year-end statement. There are still details of ShulCloud that we are completing, and it will be helpful to have all of our members on board -- thank you in advance! By mid-January, we hope to have tax-deduction letters to you, so keep an eye out for that once it's 2019. Miriam + Michael -- and Gili, Ruthie, Shulie + Shira -- miss Cambridge greatly and will be back this summer. We are looking for a 2 or 3 bedroom place to rent for the months of July and August (exact dates are somewhat flexible). Please email us (<-- link) if you know of something that will be available. Many thanks; we can't wait to see all of you! Alef-Bet Child Care (located at the shul, 8 Tremont Street), teaches children from 15 months to 5 years old. We are looking for a part-time (25 hours), year-round Toddler teacher. Be part of a team and friendly community that welcomes your talents and interests. Our program can offer some flexibility in scheduling. DEEC certification preferred. Alef-Bet offers affordable health and dental insurance, a 401k retirement savings plan, and paid vacation. We are a Jewish-oriented program and are open to all applicants. Our families are friendly and supportive of our teachers. See www.alefbet-childcare.org for more information and please email cover letter and resume to alefbetcc@gmail.com. and she is now headed to Pittsburgh for a new job! SAVE THE DATE! We are excited to share with you that we will be hosting Rabbi Robbie Harris for a Shabbaton this winter, the weekend of January 11-12. The weekend will include several opportunities to learn with Rabbi Harris: Friday evening, there will be a catered dinner and a talk by Rabbi Harris on gender in the Joseph narrative, Joseph and his Amazing Rainbow Dreamcoat. Saturday morning, he will offer a d'var Torah on the week's parsha, titled The Cow that Laid an Egg, followed by an in-depth Lunch + Learn text study over dessert, continuing our learning about the Joseph story. We welcome your participation to help sponsor this weekend at a variety of levels; click here for more details. Join Tremont Street and Asiyah for a Tu BiShvat Seder, learning, and lunar eclipse-watching the evening of Sunday, January 20 (MLK weekend). Schedule and pricing to follow -- but family dinner + seder will begin at 5, and events will run through the evening, including a screening of Cities of the Sky, directed by Joe Sousa for PBS. If you’d like to sponsor a bottle (wine $36, or grape juice $18), contact Rabbi Mathis. The Zamir Chorale of Boston and Hazzan Elias Rosemberg will be performing at Temple Emanuel, 385 Ward Street Newton on Monday evening, December 24 at 7:30pm. ​​​​​​​ For more information and tickets, click here. Are you interested in preparing or providing a dish to the Cambridge Women's Center for their holiday meal on Christmas Day? While most places close on Christmas Day, the Women's Center will remain open for drop-in services for any woman who is in need of community support on this day. On Thanksgiving we served 28 women! We are seeking dishes that serve 10-12 people. High need for 2 main dishes with meat option and 1 main dish with non-meat option, other needs include: drinks, side dishes (veggie & starch), desserts, plastic silverware, and paper plates. If you're interested in helping out, we are looking for deliveries before 6pm on Christmas Eve, or between 11am-1pm on Christmas Day (46 Pleasant St, Cambridge). If you can donate and deliver a dish, please email Director Jessye Kass. Thank you! the arrival of their daughter/sister, Maya! 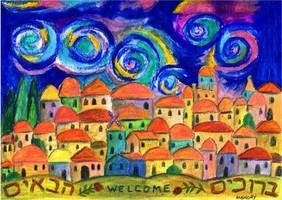 Motzei Shabbat/Saturday evening, we will enjoy havdalah and dinner, with Rabbi Harris' ever-popular Ask the Rabbi! Tomorrow, we will be hosting Noa Yuval-Hacham from the Schechter Institute in Jerusalem for a Lunch + Learn on the topic Prayer and Polemic in the Ancient Synagogue of Naaran: Ancient Synagogue Art. We are expecting to host a filmmaking production of what a Torah service looks like, and we are looking for people to participate in the film. The project has been rescheduled to this Sunday, December 16 at 10:00am, following morning services. If you're interested in participating, please contact Peter Squires. Note: although this will be an enactment of an Egalitarian Torah service, that all are welcome and invited to participate! Professor Stern plans to be at shul Saturday morning, so he can answer questions about the project then. If people wish to email me ahead of time, they certainly may do so, but people are also very much welcome to "just" show up. Filming will be starting at 10am, and we expect to be done by noon, if not before. ...or, just go to the movies! Members of Tremont Street are going to Heading Home: The Tale of Team Israel in West Newton on Sunday at 1 pm. Buy tickets here! If you are available to leyn an aliyah (or two) on December 22 and/or December 29, Linda Kasten would love to know -- or sign up here! 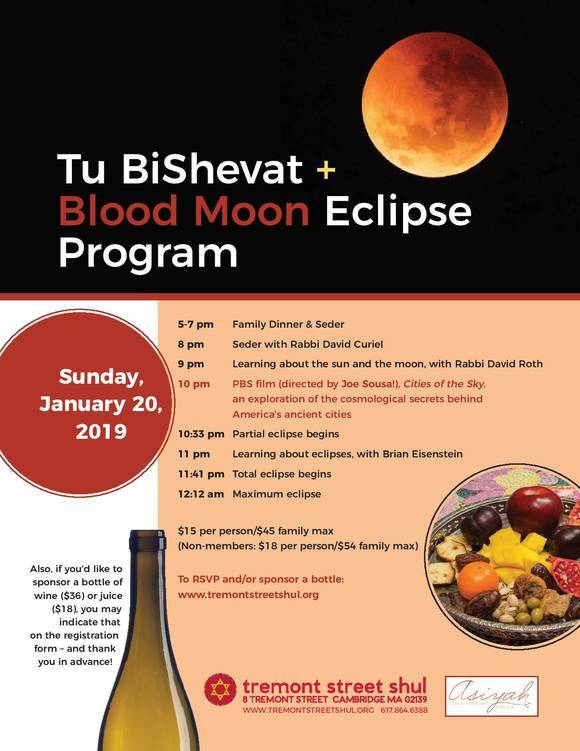 Join us Sunday, January 20 for a Tu BiShvat Seder, followed by a movie, learning and a viewing of the Blood Moon (Lunar Eclipse). Please contact Rabbi Mathis or Brian Eisenstein if you are interested in helping out or planning the event. Details to follow in the coming weeks. If you are interested in joining those who are contributing to the kiddush on December 22 in honor of community member Julie Weinrach, please go to the Donate tab of the shul website, choose Kiddush Fund as the Donation Type, and write Julie's name in the In Honor Of section. Many thanks in advance! Dec 19-20: Come learn with a remarkable -- and remarkably diverse -- panel of presenters at the Progressive Halakhah conference at Harvard Law School. Event is open to the public, but please RSVP here. on their upcoming wedding this Sunday -- in celebration, Mikhael’s mother and step-father, Linda Cooke + Paul Shaverin, are sponsoring this Friday's potluck dinner. Entrees and sufganiyot are generously provided; sides and such are still welcome via the signup link below! is sponsoring the hashkamah kiddush. Yom huledet sameach/happy birthday, Mike -- ad meah v'esrim/may you live to 120! Kiddush this week is sponsored by Arnold Reinhold + Barbara Model for Arnold's grandfather's yahrzeit, and by Peter Squires + Linda Kasten for their anniversary. In response to recent concerns, when you arrive for Shabbat services, the right-hand front door will be unlocked during davening, and the side-door by the playground will be unlocked during kiddush. As always, you will be able to leave through any door -- and as always, strollers must be parked outside. On Saturday, December 15th, we will be hosting Noa Yuval-Hacham from the Schechter Institute of Jewish Studies in Jerusalem on the topic Prayer and Polemic in the Ancient Synagogue of Naaran: Ancient Synagogue Art. The kiddush that day will be sponsored by the Timoner family in honor of Maya's arrival, so it will be a wonderful morning of davening, community, and learning! Have an hour or so a week to help our community? Be a leyning coordinator for one of the five books! We're splitting the work to reduce the burden; so far, coordinating for Breishit has practically run itself. We have spreadsheets and practices in place -- and experienced hands to help. Let Linda Kasten know if you want a turn: catch her at kiddush or email her here! 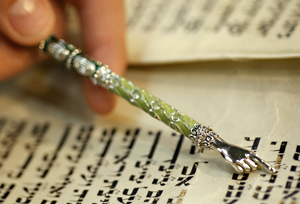 Meanwhile, check the leyning schedule and sign up to read an aliyah or two! So, you want to be in the movies...? We are expecting to host a filmmaking production of what a Torah service looks like, and we are looking for people to participate in the film. The project has been rescheduled to Sunday, December 16 following morning services (Orthodox). If you're interested in participating, please contact Peter Squires. Join us for a Baseball Movie Outing! Heading Home: The Tale of Team Israel (the story of the Israeli team at the World Baseball Classic) is having its theatrical release in West Newton in two weeks, and a group will be attending the 1:00 showing on Sunday, December 16th. Please email Brian BY WEDNESDAY to let him know if you are interested. We also hope to meet with one of the film's producers! Dec 12, 7:30pm: Camberville Open Beit Midrash, The Blessing of Blessings: Exploring a Positive Relationship to Food Based in Jewish Text and Experience. Check it out on Facebook and RSVP online using this form. The Chanukah Oil Drive returns! In past years, members of the congregation have been very generous in donating unopened bottles of cooking oil to families in need. Once again there will be a box for collecting bottles of oil - vegetable, canola, olive - to be delivered to the Falcon Market, the food pantry housed at Cambridge Rindge + Latin School. The collection will be ongoing through December 15th. Thank you for considering supporting this drive!